I have never been a giant Halloween fan. Don’t get me wrong; I don’t hate it or anything. It’s just not my favorite holiday. But as with everything else, we do have some traditions that we have had that Eddie is now becoming a part of. First we have our annual pumpkin choosing. 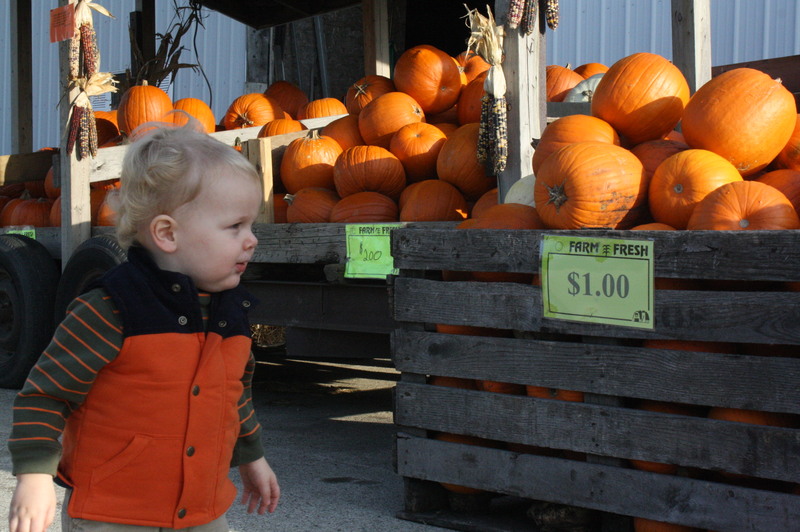 This has usually consisted of me buying pumpkins from Meijer or Family Fare, but this year we took Eddie to an actual roadside farm that was selling them. He had a ball! 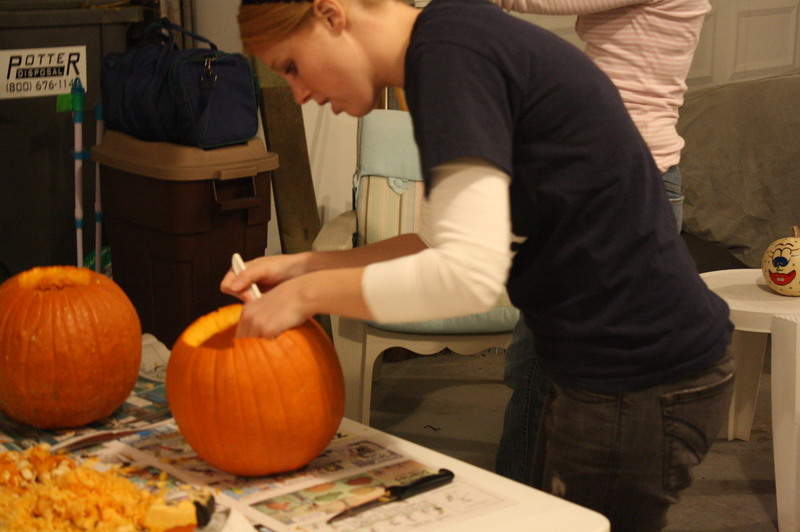 Another tradition we have is to go to Cortney’s mom and stepdad’s house to carve pumpkins. 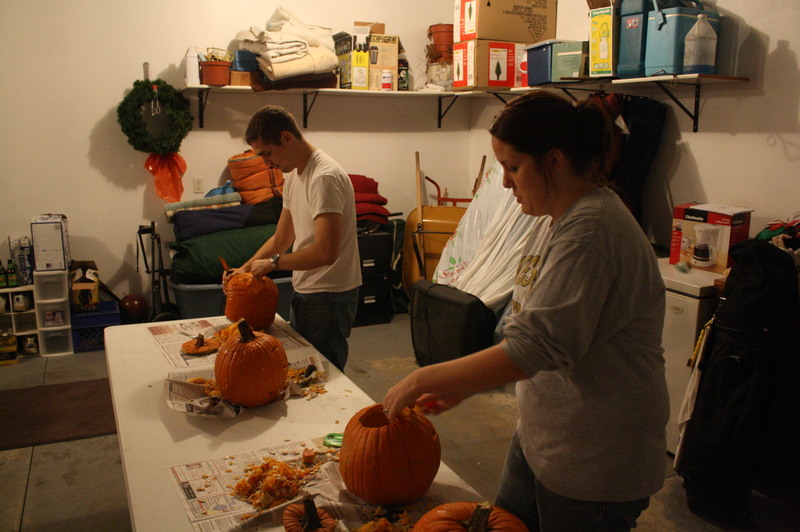 Granny Kim and Gramps have us over each year for a carve-a-thon and a yummy meal! Granny picks all of us a pumpkin to carve. And each year it is a BIG deal to see who can have the coolest design. I’m telling you…we are serious. It’s a little intimidating because people like Cort and Dave really put a TON of thought into theirs (a couple years ago Dave did the Obama logo…it was awesome. Until one of the dogs ate the pumpkin and you could tell what it was). I think this year, Grampy Ray won the prize! His was actually quite good compared to what he has created in the past! Ha ha! 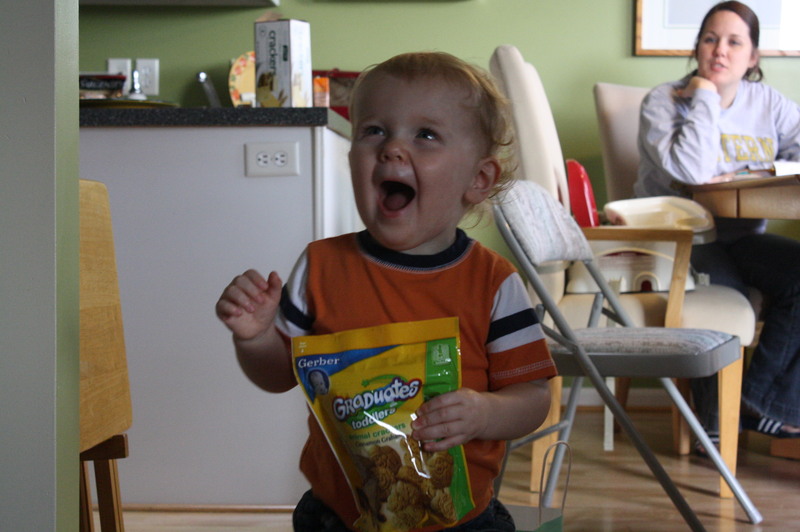 Granny sure knows the way to this guy’s heart! 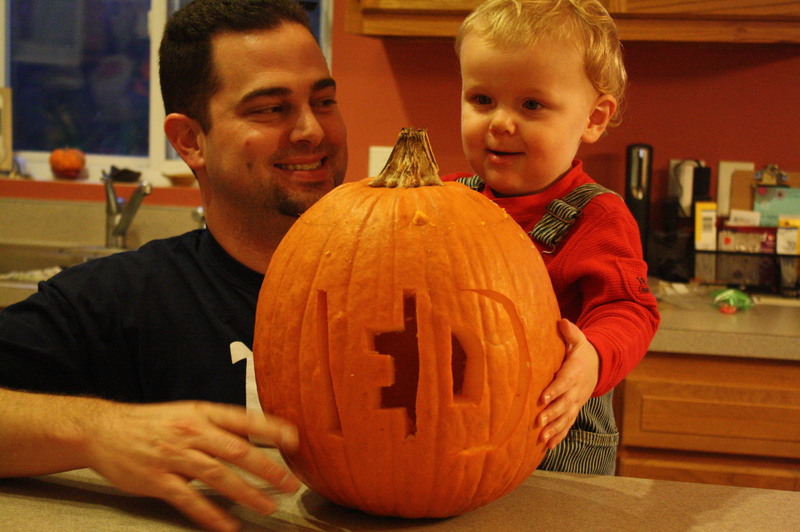 Of course, we still had a pumpkin at home that needed carving too, so Friday night Eddie and Daddy grabbed that pumpkin and did some damage. 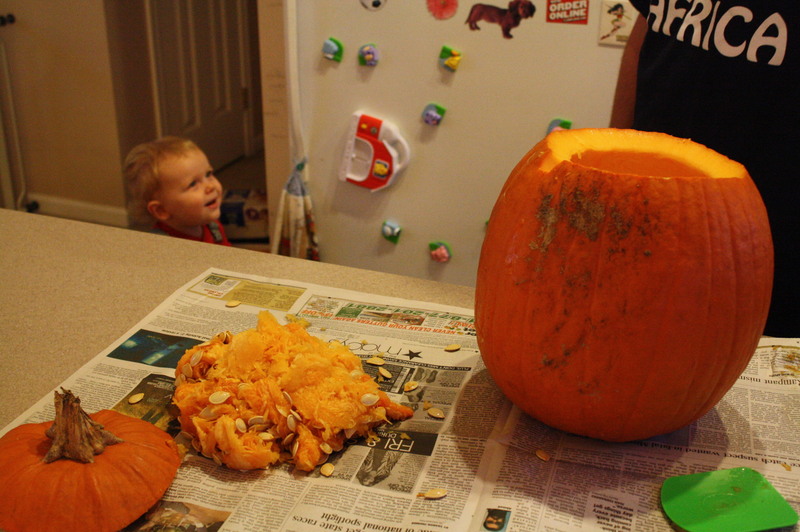 Daddy did most of the work, of course, since sharp things and gooey things are not things Momma lets Eddie partake in yet. The final result? Totally awesome! 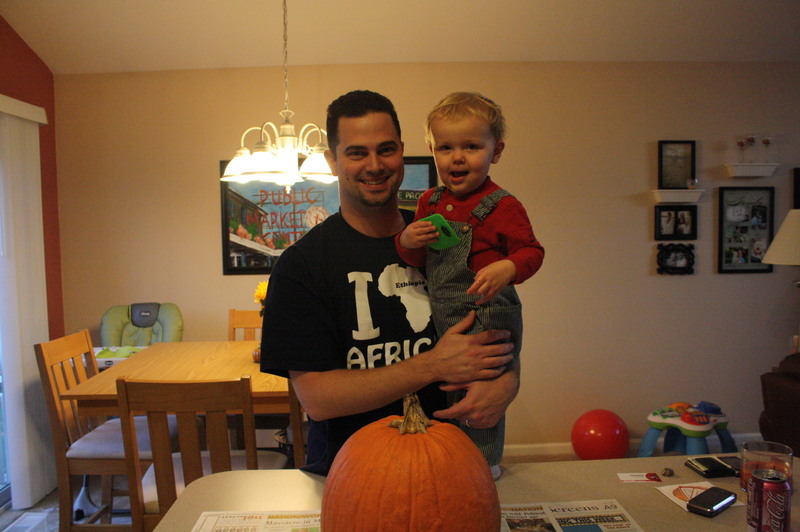 and we needed to prop him up next to his jack-o-lantern to get a picture. Yes, that is some good vintage Eddie right there! 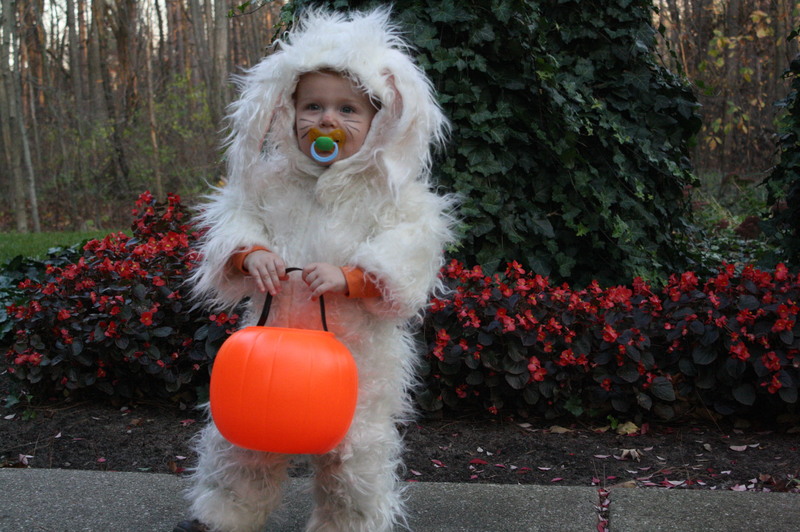 This year, I didn’t want to spend money on a costume he would only wear for maybe an hour. I was all set to go to Mom and Baby Again to see what they had in his size, when my mom reminded me of the bunny costumes she made for my brothers and me when we were little. That is my little brother, Chris, and me all dressed up in furry suits my mom made for us. That fur? Was on my bedroom walls when we first moved into the house my parents still live in. Yup, it was awful. 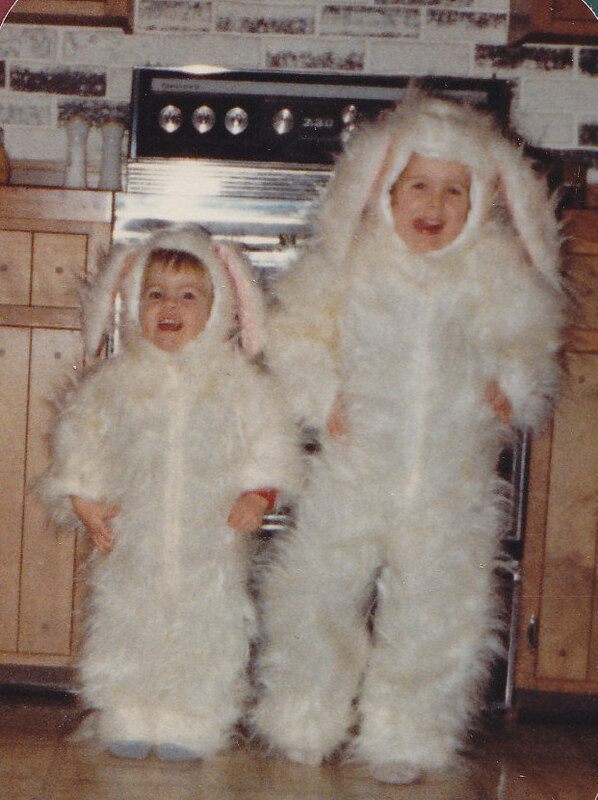 That is why my mom pulled it off the walls…and created bunny suits. Anyway, my mom pulled those costumes out of her cedar closet and wouldn’t you know it? The small one fit Eddie! I die of cute!!! He was so good about wearing the “dead cat” suit and the headpiece! 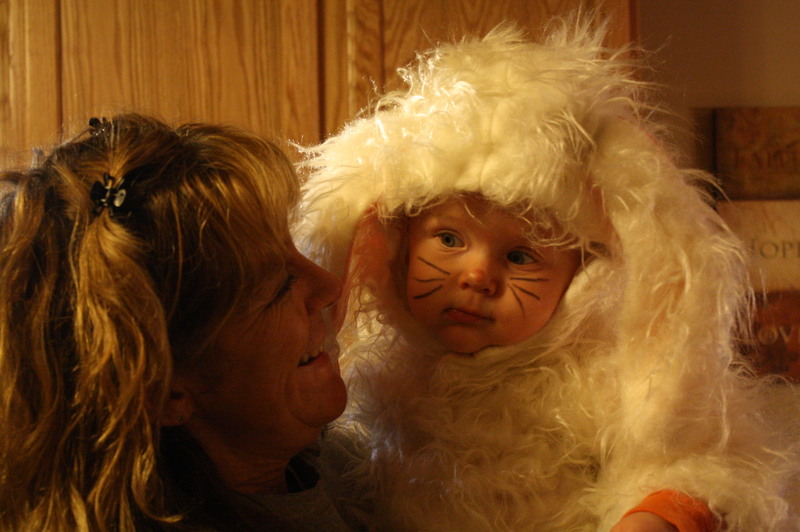 So of course our first stop was Grandma’s house…since she made the costume. Thank you, grandma, for letting me wear this costume. Back in our subdivision, our little bunny lasted a whole two houses before it was time to go back home. 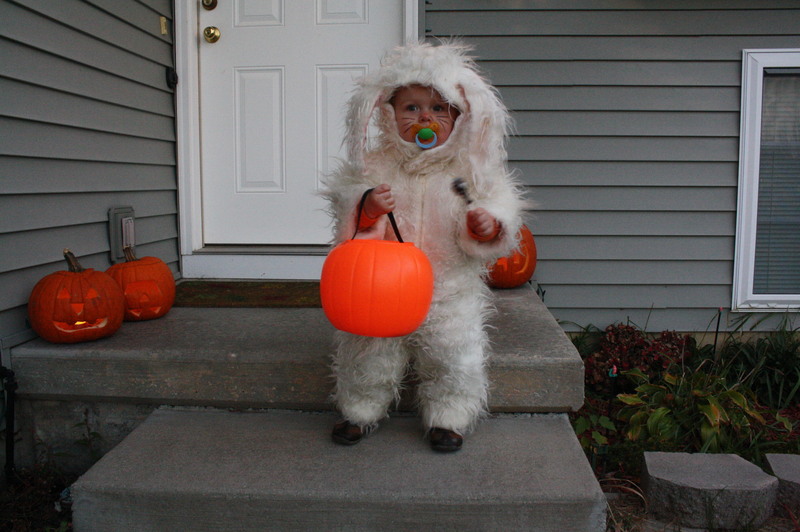 He doesn’t really understand the concept of trick-or-treating anyway. But he does understand candy! And with a bucket of the stuff? He did NOT want to be in that costume any longer! It was time to go inside! 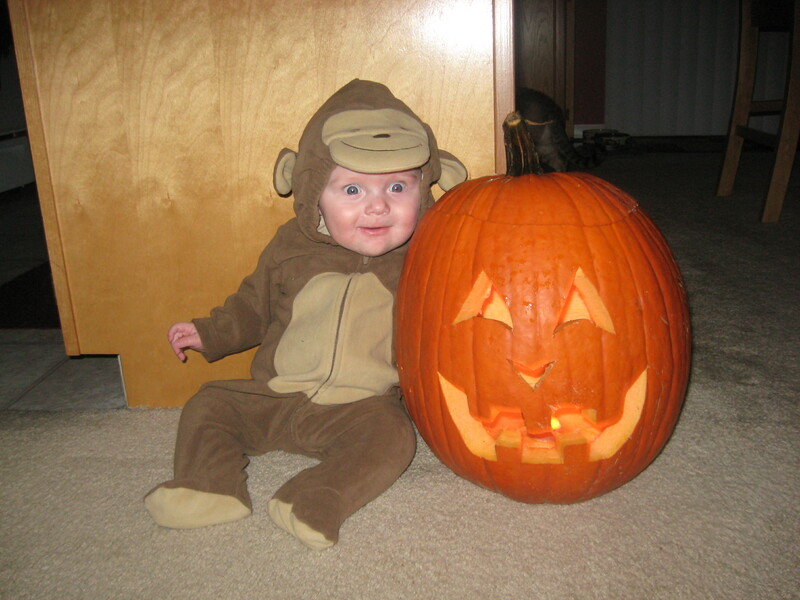 This post is linked with Cole’s First Blog’s Halloween Parade. 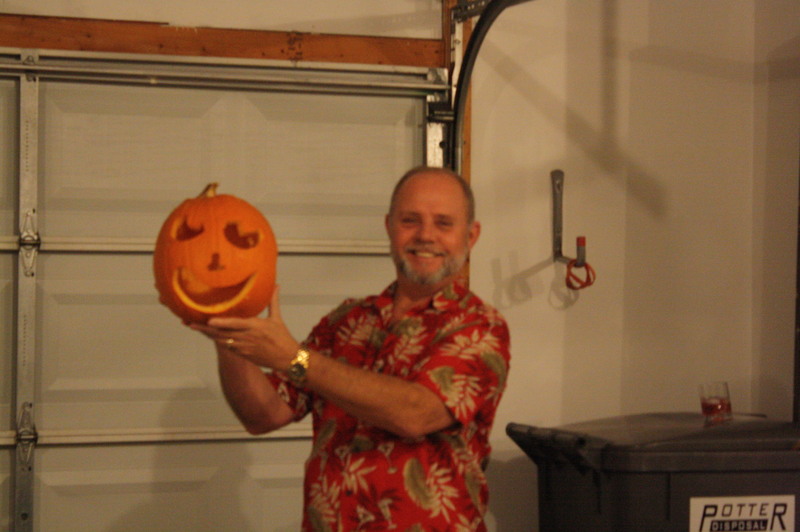 Click below to see more fun Halloween stories! To any of you who like to link up to Top Ten Tuesdays? This week is Top Ten children’s books you or your child loves! Come back Tuesday to see our favorites and link up with yours! Oh my goodness, his curls are TO DIE FOR! So cute! Thanks! Yeah, that material being on my walls? seemed neat to me at 4 years old, but now? I totally get why my mom wanted it OFF the walls. And yes, little pumpkins for a $1. We live in the country, dude! 🙂 Thanks for stopping by our little stop of the Halloween parade! Yeah, ummm, I totally typed the wrong thing for my URL in my former comment – sorry! That bunny costume is so adorable. And amazing that it was in such good shape, since you look pretty young in that picture! I was probably like 5 in that picture, so the costume is probably around 28 years old? My mom had it cleaned and kept it in her cedar closet all these years! Crazy! I feel a little silly because I’ve been wondering why you didn’t have any new posts. I finally remembered yesterday that you moved your blog! You’re back in my reader now, yay! Thank you! I know, that fur was hideous. Even at 4 I knew that! I guess more people than I thought weren’t getting my feeds. It’s weird because some are and some aren’t. Huh.